Have you ever wished you could receive a letter in the mail which would address your concerns or fears and spoke to you in such a manner that you felt unconditionally supported? The Being Place’s “Letters to a Dearheart” are meant for someone such as you. This has been a difficult month for us, Dearheart. Many dangerous people exist in the world and it’s a challenge to feel safe. Our provoked fears may intensify other unfinished business which for most of us, most of the time lies dormant. Then, something we hadn’t planned or expected occurs, and those deep rooted attitudes of resentment, anger, and bitterness can rear their heads and convince us that love is not the answer but isolation is. Dearheart, keep up your spirits. We all go through personal periods of loss and tragedy during which we turn inward to a time of solitude as part of a process for healing. This solitude is a necessity to recalibrate and reorder our minds and hearts which are frequently ripped by change. But as you’re seeking inward, remember to also send out the good energy which is the essence of you, Dearheart. Unpredictable human beings have buffeted the progression of the world since time immemorial. Whether acts of violence occur because of mental illness or the soul sickness, known as evil, hatred and judgement, makes no difference. All of those etiologies are healed by positive vibrations others send out on behalf of a Higher Power who is All Power (God). Whether or not you want to march with signs of love and understanding in the public venues or send it out quietly from your living room makes no difference, Dearheart. Either way, love is continually being cycled through the universe. How do you cleanse yourself, Dearheart? The same way you heal the world. You do this through prayer and meditation and you share your fears and sorrows with another human being, who will then help you reclaim the grace that was subsumed with judgement. If you need me, I am here, Dearheart. Layer upon layer of daily living takes its toll on us, Dearheart. When you wipe away the grime and the grit, though, underneath it is a Dearheart of Gold. As an only child, I bargained with God to protect me from seeing my parents die. God ignored my fear-of-grief-based request although He gave me the grace of nearly two decades between the departure of them. My father left us quickly. He had gone in for placement of a defibrillator pacemaker. I believe he lost interest in life when doctors told him he wouldn’t be able to repair lawnmowers because of the interference of the electromagnetic fields on the heart device. Repairing lawnmowers was a satisfying hobby for him because it was mechanical and practical. My mother lived independently for many years after my father died and we were mutually supportive to each other. We took over mowing her yard and when I returned to work she took over caring for my first-born son who was only six months old when his grandfather died. My father left us quickly, but my mother took her time. She lived with me and my family for the last two and a half years of her life. Daily, I was filled with anxious dread she’d fall and re-break her femur, which was the body part that ultimately stole her independence. She fell twice. The first time she broke her nose, blackened her eye and sprained her ankle. The second time was the precursor to her final days as she was just too weak to hold herself up anymore. Fast forward two years after her death and I continue to process the profundity of having cared for my mother. I spontaneously completed an on-line survey for the Institute for Spirituality and Health, which is conducting research on personal quality and medical hardship and researchers followed up with a phone interview. He queried about how society could better support people who are experiencing medical hardships. I didn’t delve into political divisions but spoke about the benefit to society when families are better supported in caring for any relative with a medical need. If women were paid for the informal caregiving they provide to relatives, it would conservatively be valued between $148 billion and $188 billion annually. He asked me how I dealt with the disruption within my family when my mother lived with me. It wasn’t a disruption. It was a 180-degree change. Everything changed within and without for our family, including our living arrangement. When women provide unpaid caregiving, they sacrifice about $40,000 in retirement savings because of the compromise they make for paid work. To accommodate my mother’s mobility needs, we moved from a 1,000-square foot home to a 3,000-square foot home and invested in handicap accessibility tools. I transferred my retirement savings into this family investment. To supplement financially, some caregivers are fortunate to have a large network of extended family who can pitch in. As an only child, my extended family consisted of my husband and two sons. My husband worked to keep the roof over our heads, and my sons weren’t old enough to drive themselves, much less anyone else. So, any supplemental support we needed was a fee-based one, including for tasks as Good Samaritanish as giving my mother a ride to see her doctor. Research and statistics indicate caregivers absorb an inordinate amount of stress and sacrifice. With the baby boom population aging at the speed of sound, more middle-aged children will be stepping into new roles. No matter a person’s inner stockpile of eagerness, loyalty, and love, caretaking is daunting. Many medical-specific organizations and caregiver-based groups offer in-person and on-line support groups. Both society and families benefit financially and emotionally when caregivers are supported. Without stating it directly, he inquired as to the psychological toll on me. I reflected the personal story of the anonymous statistics and while my mother was living with me I didn’t have time to participate in emotionally satisfying functions. In the remote area in which I lived, it was difficult to access therapy but I reached out for on-line counseling, which was a competent substitute for a face-to-face therapeutic relationship. Pity on them, not me. I couldn’t really do it either, yet I did. And if life should demand this from you, you can, too. Because that’s what well-meaning families do. If someone is sick, you take them to the doctor. Sometimes, paramedics are called in to put the person in an ambulance to take them to the ER. So where do you go if you are spiritually sick? You go to the Spiritual Doctor. Of course, there are specialists who deal with the brain, the heart, the skin, the kidneys. If you have a cold, you can go to the brain doctor, but it’s not necessary. The brain doctor might choose to not see you because she has more serious cases which require her level of expertise. So you go to the general practitioner who sees a wide variety of common disorders. How do you decide how spiritually sick someone is? What are their symptoms? And who are the specialists of the Higher Order cases? That’s a tough question for which to determine an answer. Ministers don’t advertise specialties like a doctor does, yet it would seem a similar comparison could be made. What if a Healer was some obscure medicine/religious person who lived in a remote area? How would you find them? And if it’s still ultimately God, God heals us through his people. You call the Great Healer through prayer, but you still have to pray. My ego is scared at least a million times a day and the shell of it is so strong that my spirit can barely breathe. I suffocate my soul with layers of roles and labels I pin on myself. Eventually, though, through aging and, ultimately, death all of these superficial wallpaper titles will be chipped and stripped away and all to remain will be my spirit and soul. It is this untamable, unnamable aspect of self God loves. Fortunately, the indefatigable spirit within me constantly seeks out God. Briefly and interstitially it peeks out with no attachment to food, caffeine, money, or smooth relationships. In these rare moments, life can just be as it is and I have an opportunity to soar. Author’s Note: I wrote this piece two years ago, when I facilitated a peer-based depression and bipolar support group. The artwork in the Evelyn Rubenstein Jewish Community prompted me to share my thoughts about my father, who would have turned 87 today. He died 20 years ago on April 26, 1999. If you are struggling with depression or other distress, please reach out to the National Suicide Prevention Hotline at 1-800-273-8255, or attend your local Depression Bipolar Support Alliance chapter. Support groups are always free to participants. My father, who would have turned 85 today, showed his love in practical ways. He grew a garden and its bounty he shared with others, he repaired lawnmowers for free, and he often gave rides to strangers who were down on their luck. I inherited one of those three talents from my father. Giving rides for and toward strangers in unfamiliar territory is something I’m able and willing to do. So, I took the opportunity offered on my late father’s birthday to facilitate a depression and bipolar support group. I plugged in the GPS the Evelyn Rubenstein Jewish Community Center. My father studied the Bible, searching for answers to explain the pain and suffering he witnessed during his time on Earth. Had he not been a Presbyterian Jehovah’s Witness, I think he would have found solace in the Jewish faith. At least that’s what I think if I work under the premise children are at least half and half of each parent. I think about my mother all the time, but I feel all the time the same way my father seemed to feel about many things in life. The generational difference between him and I, though, is I was born at a time when tools became available to more peacefully cope with the suffering that surrounds us. My father, however, was born at a time when he dropped out of high school to enlist in a war. And when he returned, he responded the way anyone would who sees the powerful injustice of suffering. He raged at it. His favorite book in the Old Testament was Ecclesiastes: There is nothing new under the sun and everything is meaningless. After the group, I studied the gallery of Jewish philosophy hanging in the community center and wondered what my father would have experienced had he been there with me. I like to think he would have realized how whole his broken heart really was. And that he would have found reassurance in that love is stronger than death. Do you need a breakthrough? One of the most gratifying aspects of serving as a counselor is the breakthrough moment clients experience in finding the source of dissonance within their lives. Whether it’s the honest acknowledgement of a feeling towards another or the awareness of their own behavior, the breakthrough moment is an earth-shaking moment which is felt by both of us. How does the process unfold to arrive at a particular apex in time? Like a drowning person who is frantically swimming to the water’s surface, a counseling client is sifting through a tidal wave of emotions and thoughts which is submerging her authenticity. A word at a time, a client wrings out the excesses of her relationships to get to the simplicity of one relationship—the relationship with herself. When the breakthrough occurs, it’s like the near drowning swimmer who has reached through the water’s surface. He is freed to let out the carbon dioxide suffocating him and inhale the oxygen of a life that has been missing. It’s a release of a defense from the intimacy with the universe followed by a burst of energy which gives back a life for one’s self. What breakthrough moment are you waiting for? Has your life knocked the breath out of you? No wonder, as multi-tasking has been tagged as the the working person’s holy grail when it comes to getting it done. But for all of the star treatment multi-tasking has garnered over the years, efficiency experts are now learning that focusing on one task at a time is more productive than simultaneously attempting to complete many things. If you find yourself distracted and scattered throughout the day, spending a few minutes paying attention to your breathing can bring back your focus. Breathing by its very nature is a singular activity. Try exhaling and inhaling at the same time. As a foundation to a mindfulness way of life, breathing is the cornerstone. 1. In the beginning, just breathe and pay attention to your breath without any inclination to adjust its depth or length. 2. If feeling anxious, take time to breathe deep into your belly. This breath intention will help dissipate feelings of anxiety. 3. Alternate breaths by covering one nostril and taking one inhale and exhale with one nostril and then switching. This technique will bring more attention to the air that passes through your sinus. Many books, cds, and dvds are available from a variety of sources for personal use to learn how to improve your breathing technique. Local community groups, such as mental health groups or hospitals, may offer in-person classes. At its breakneck speed, life takes our breath away. Taking a few minutes each day to catch it, will allow us to be living beings again. You know the feeling. You had a disagreement with another person and in your mind you forgave. You were able to forgive them because you ended your relationship with them. But did you really forgive them or did you just forget them? The answer to that question will be revealed next time you unexpectedly run into them in a location you weren’t prepared for, such as your local grocery store. If your heart jumps and your stomach feels anxious, then the energy of the conflict hasn’t subsided and, frankly, you focused on the forgetting but not the forgiving. So what do you do when you come across THAT person? Here are some options, only one of them recommended. 1. Turn around and pretend you didn’t see them. 2. Ram your shopping cart into the back of their legs and pretend you didn’t see them. As uncomfortable as it is, facing THAT person is a response coming from a stance of self empowerment. Responding as a whipped puppy with your tail between your legs will only add to the dynamic belief you were on the losing end of the conflict. Instead, take a deep breath, open your eyes, both in your head and heart, and see the person in front of you. What you discover might surprise you about them and yourself. Now, for the awkward moment. Does seeing them include speaking? Maybe. But certainly on your terms and not theirs. You can say hello, or nod your head and give a small smile (but not the smirk smile) and keep walking. If they initiate a conversation, such as, “how are you?” say, “I’m great!” and keep on walking. So the moment has passed and you SAW them, what do you do next to FORGIVE them? Here are some steps that may help you with the process of forgiveness. 2. 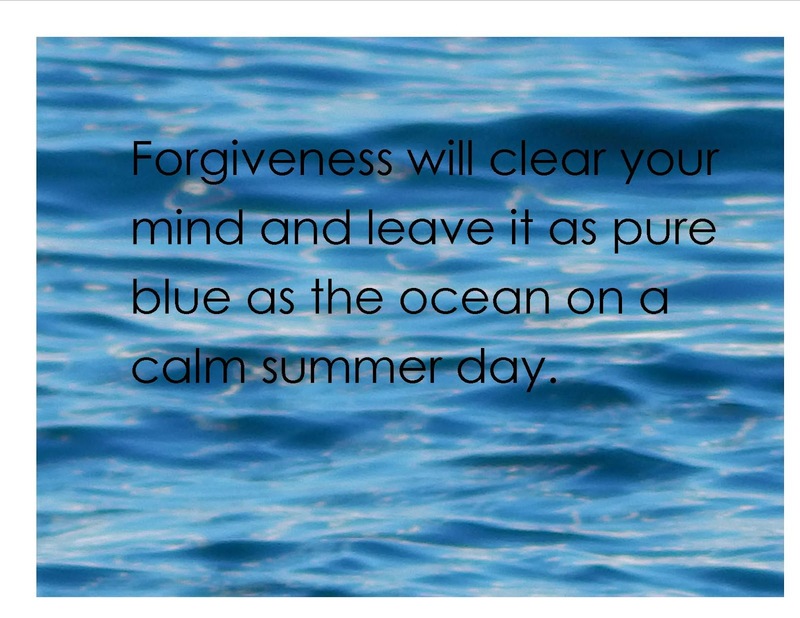 Pray and meditate on the concept of forgiveness. Sometimes, we aren’t ready to pray for THAT person, but we can start the process by quieting the thoughts that racket around like they are on a handball court by focusing on the theme of forgiveness. 3. When you are ready to move to the next stage, pray for good things for yourself and THAT person. This action is empowering because it gives you control. When you start, you don’t have to be sincere, but over time you may find yourself believing that both of you deserve the gift of a life filled with blessings. 4. Understand that the role of forgiveness isn’t to change THAT person as change may never happen to your expectations and demands, but it is there to heal you and give you a better quality of life. Forgiveness is a voluntary choice with a process and while forgetting may be a component of it, that, in and of itself, isn’t an indication of healing. If a chance encounter with someone with whom you have had a dispute has rattled your psyche’s bones, then it may be time for you to say “Oh, Forgiveness” so the next time you encounter them you can “See” them.